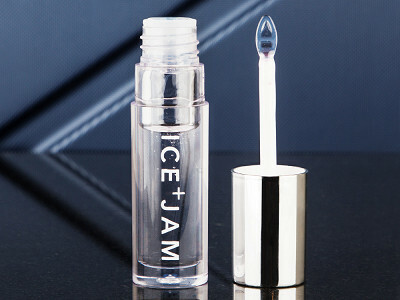 We can’t resist multi-taskers, and ICE + JAM’s lip plumping gloss fits the bill. In fact, all their Made in the USA lip goods pull double duty. The clear gloss adds shine and boosts fullness. It also enhances your lips’ natural color by reacting to your body’s unique chemistry, known as its pH. Their lipsticks pack a two-for-one punch, too. Each is deeply pigmented, so the colors are rich and long-lasting. And they’re made with cupuacu butter—similar to cocoa butter—found in the Amazon. 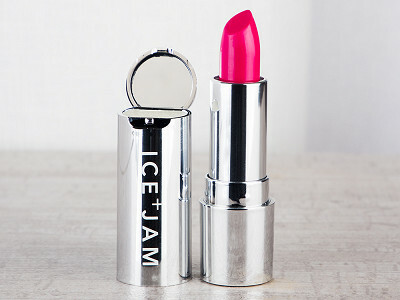 This tropical moisturizer makes the lipsticks creamy and helps them glide on smoothly. The lipstick cap is even multi-functional—pop open the tiny (adorable) flip-top mirror for touch-ups on the go, and there’s a bonus pot of cupuacu lip balm tucked in there, too. The plumper and lipsticks are both Made in the USA with gluten-, paraben-, and cruelty-free ingredients, so you can feel even better about how great your lips look. Hello everyone! I'm proud to introduce ICE + JAM to The Grommet. I'd be happy to answer any questions you have! Is your product cruelty free? yes - my question as well! 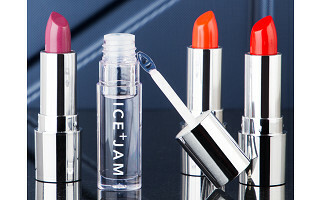 Hi Vickie and Judy, yes, Ice + Jam products are cruelty-free. Thank you for launching your product! I am gluten free and have a difficult time finding gluten free lip products. I love that you are located in Cleveland Ohio, just 1 hour north of my home. All the best! What is the total cost? It would be $47 without tax and shipping for both the plumper and lipstick, Alice. Any future for other colors in the tan/oatmeal family? I'll defer to Jamie on that one, Lisa. @Lisa i am wearing "On The Desk at the moment".. it's a perfect neutral base with a little orangey-browny-pink combo. It's coming soon! What are the colors pictured above, L to R? I'm interested in the mauve-looking color! What is your return policy? Hi Lauri, left to right we have Shocking Pink, Perfect Plum, Saturated Orange, and Spotlight Red. You can see our complete return policy here. How long does it stay on your lips? what color is the model wearing on the order page? That looks like Perfect Plum, Nancy. It's frustrating that the cost of the lipstick and plumper are just below the amount needed for free shipping. It probably means I won't be ordering. Hi Ximena, we hear you. To help you clear the threshold, we have a few inexpensive lip balms that you can give you a complete lip treatment and free shipping. Which color(s) lipstick would best for blonde, blue eyed , cool tone complexion? Hi Rosemary, on the next page you can see a woman with blonde hair wearing the plum and above, Jamie appears to be wearing the spotlight red. Someone from our office also recommended the shocking pink. @Rosemary , mike is right.. the perfect plum is a no brainer but the peachy pink sounds totally like your JAM! May I suggest that the names of the most colors be included on the page that shows the different ones to choose from? Or am I missing something? ???? Hi Lynn, if you hover over each image, the name of the shade will pop up. I'm with Ximena Ann on the cost factor and the shipping. I looked, but there's no mention of any gloss anywhere on the ordering page? Hi Linda, we have a number of lip balms on site that will get you just over the $50 line. Check out our personal care section. 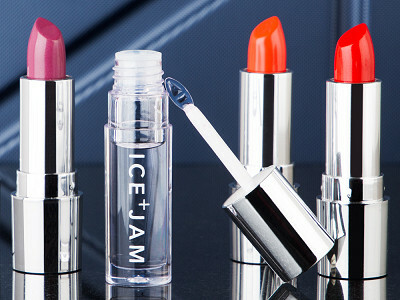 We can’t resist multi-taskers, and ICE + JAM’s lip plumping gloss fits the bill. In fact, all their Made in the USA lip goods pull double duty. The clear gloss adds shine and boosts fullness. It also enhances your lips’ natural color by reacting to your body’s unique chemistry, known as its pH. Their lipsticks pack a two-for-one punch, too. Each is deeply pigmented, so the colors are rich and long-lasting. And they’re made with cupuacu butter—similar to cocoa butter—found in the Amazon. 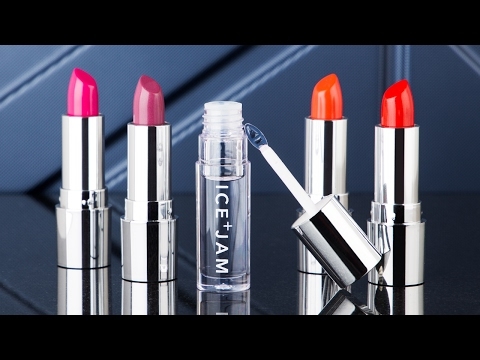 This tropical moisturizer makes the lipsticks creamy and helps them glide on smoothly. The lipstick cap is even multi-functional—pop open the tiny (adorable) flip-top mirror for touch-ups on the go, and there’s a bonus pot of cupuacu lip balm tucked in there, too.